As with most red-green colorblind people I have trouble with many things. Someone with a more severe deficiency than I may find traffic lights difficult to interpret but even in less critical areas the inability to tell red and green apart reliably can be quite frustrating. If I walked around any office or my house I could easily find many things with indicator lights that are a variety of colors. Most are some combination of red, green and yellow. If red means charging and green means ready then how am I to know which is which? When you live with this sort of problem for a while you get used to it, sometimes you can find ways around it. With one of my camera chargers I find I can tell if the LED is orange or green by putting my eye right up to it and letting the LED fill my vision as a blurry mass of color. By doing this I am at least able to fairly reliably distinguish which color that particular device is displaying. This doesn't always work and it isn't really a very practical solution. One way to make it easier to distinguish colors is to use colored filters. There are a number of ways one could go about this but we can fairly easily summarize the basics by looking at a color wheel. 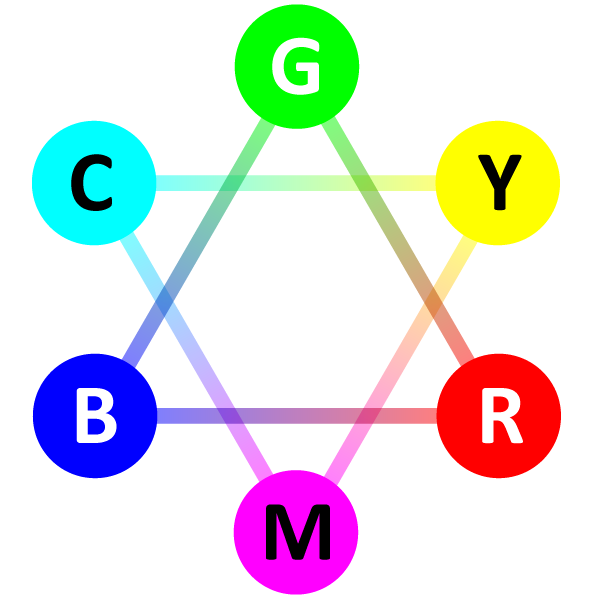 A basic color wheel as shown on the left consists of the additive primaries (red, green and blue) and the subtractive primaries (cyan, magenta and yellow). The additive primaries combine to create white while the subtractive primaries combine to create black. Both of these concepts form the basis for many types of display and printing systems. With the right C, M and Y primaries a printer could in theory produce a full range of colors and neutral tones and with R, G and B a computer monitor or TV can display the the full range of colors and neutral tones as well. The positioning of the various colors is important too. If you looked through a red filter at something cyan in color you would see that it becomes very dark (the basis behind using a red filter to darken the sky in B&W photography). On the other hand looking through a red filter at a red object would make it appear bright by comparison. Based on this wheel a colorblind person could carry some color filters with him to help understand the colors in his surroundings. Red and green filters could be used to help distinguish between red and green indicator lights for example. Hold up a red filter and the green lights would dim while the red lights appear bright. The opposite happens if you hold up the green filter. I have considered carrying filters in this manner although much of the time I can get by without them and fact that they would get torn up fairly quickly in my wallet made me rule that idea out. The Seekey gets around this problem by having green and red hard plastic filters housed in a slim case for protection. You can easily swing out the filters when you need them, making this a much more convenient tool in many ways than dealing with flimsy, floppy gel filters. The Seekey was invented by Kenneth Allblom and is available for purchase using Paypal from almost anywhere although getting one delivered to the US isn't cheap since they're located in Sweden. After shipping a Seekey costs over $50 in the USA but I felt it was something worth trying and writing about for the site and that it's something I would be glad I had in the long run for my own ease of interpreting colors. The Seekey is shipped well protected and with a sheet of paper explaining its use. There really isn't much to say about the Seekey, it works as expected and as advertised. The price is steep but my curiosity got the best of me and I can say it's a fun little toy and in many ways has good conversation starting potential. Is it really worth the price' That's a tough thing to say, I don't think I would generally recommend it to everyone but for those with severe enough color deficiencies it is certainly worth looking in to. Check out the Seekey website for more information and to see some more explanations of its use.